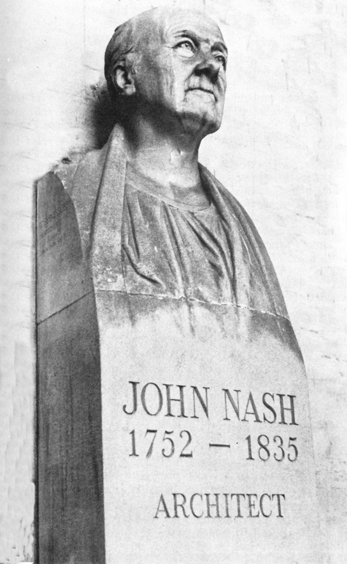 JOHN NASH was probably the architect who did more to change the appearance of London than any man has done since the days of Sir Christopher Wren and the rebuilding programme which took place after the Great Fire. of 1666. Not many people seem to realise that Nash spent the last years of his life in the Isle of Wight and that he lies buried just to the south of the tower of the church at East Cowes of which he himself was the architect. A simple inscriptions reads: 'Sacred to the memory of John Nash Esqre of East Cowes Castle who departed this life May 13th 1835 aged 83 years. Also of Mary Ann his wife who died Febry 7th 1851. Unfortunately East Cowes Castle, which Nash designed in 1798, was demolished in 1965 after being in a ruinous state for several years. It was a very grand and imposing building and it was a thousand pities that it had to go. Ironically enough, Nash (a speculative builder and developer himself) would probably have understood! The details of Nash's early life are somewhat obscure but it seems that he was born in London in 1752, the son of an engineer and millwright. Early in his career he was employed in the office of a well-known architect, Sir Robert Taylor, but he left when a merchant uncle gave him a generous bequest. Around the year 1778 he went into operation as a speculative builder but he quickly became bankrupt and went to live in Carmarthen. He was advised by a fellow architect, S P Cockerell, to resume his work and slowly but surely he built up a steady practice again — this time mostly in Wales and in the west of England. Among his early works were designs for prisons at Carmarthen, Cardigan and Hereford. Around the year 1796 he returned to London and entered into some form of partnership with the celebrated landscape gardener, Humphrey Repton. This was probably the way by which he came to the notice of the Prince of Wales (afterwards George IV). As early as 1798 (the same year that he married) Nash was responsible for designing a conservatory for the heir to the throne. Prior to 1811 (the year that the Prince of Wales became Prince Regent) Nash was principally known as the architect of many notable country houses including East Cowes Castle; Llanayron, Cardiganshire; Sundridge Park,, Kent; Southgate Grove, Middlesex; Blaine Hamlet, near Bristol and Cronkhill, Staffordshire. When the Regency began, Nash was afforded as great an opportunity to display his creative ability as had come the way of Sir Christopher Wren a century and a half earlier. He was the Regent's personal architect and from 1813 until 1815 he was deputy Surveyor General as well. In these capacities Nash was responsible for such grandiose planning schemes as the development of Regent's Park as a sort of 'aristocratic garden city' and the designing of a new thoroughfare which was to be named Regent Street. Many of Nash's buildings around Regent's Park still survive and are among London's most attractive crescents and terraces. In Regent Street, however, it is another story. The only building which has survived here is the unusual building of All Souls' Church in Langham Place. This is situated next door to the BBC and has a delightful circular portico. Nash was also responsible for the development of the St James's Park area, in addition to the planning of Trafalgar Square and the west part of the Strand. For the benefit of his royal patron, Nash remodelled the extraordinary Brighton Pavilion and he was responsible for the complete reconstruction of Buckingham House. This was renamed Buckingham Palace but one of Nash's most important plans for this building misfired. He intended that the monarch should enter his London home through a replica of a Roman triumphal arch. After Nash's death, however, the ceremonial entrance was moved in 1850-1 to Cumberland Gate, Hyde Park and today it is better known as the Marble Arch. Nash's popularity fell when his patron died and in 1831 he had to suffer the ignominy of appearing at an inquiry which was held to probe the expenditure incurred in the construction of Bucking- ham Palace. This must have been a very distressing experience for an old and distinguished architect. But is not our Nash, too, a very great master? In his latter years Nash retired to East Cowes Castle and he died in 1835 in his 84th year. His work, however, lives on — not least in Hampshire and the Isle of Wight. A house at Bramshaw named Warrens was probably designed by Nash around the year 1805. Houghton Lodge, a beautiful 'Gothick' cottage of 1801 over- looking the River Test, was also probably designed by him. Preshaw House, near Warnford, has notable additions on its south side by Nash. As is perhaps to be expected, the most notable examples of Nash's work in the county is to be found in the Isle of Wight. 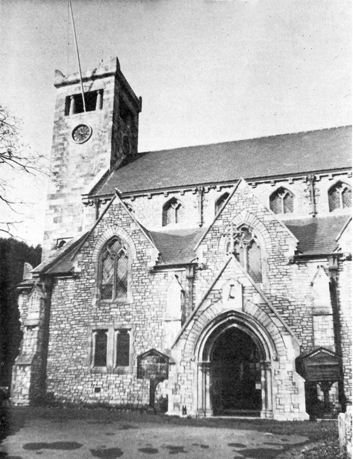 In addition to East Cowes Castle and the nearby church where he is buried (a rather plain building) he designed in 1816 the very striking tower of St Mary's Church, West Cowes. Sir Nikolaus Pevsner has said that it looks like the work of a central European architect of the early 20th century! It is remarkably bare and free from fussy decoration. The one bold piece of ornament is the insertion of short Doric columns in the bell openings. 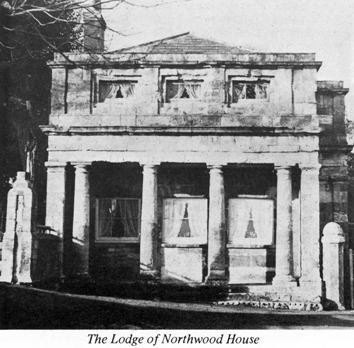 It is possible that the nearby Northwood House is by Nash; certainly the Lodge was designed by the great architect. 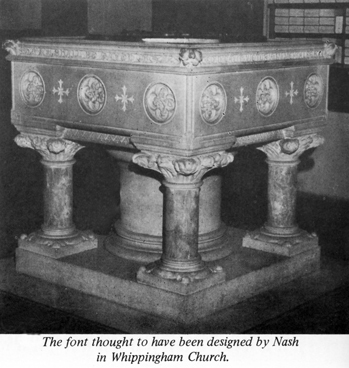 It is also just possible that the font at Whippingham Church was designed by Nash. He was indisputably the architect of two distinguished buildings in Newport. The Town Hall in the High Street was built in 1816. Unfortunately, however, a clock tower was subsequently erected to celebrate the Jubilee of Queen Victoria in 1887. This rather spoils the simple and dignified Nash proportions. The Guildhall in St James's Square was designed by Nash in 1819. It is a fine and substantial building. Few people have left their mark on history so literally as did John Nash. West and East Cowes have always attracted famous men whether they be visitors for the yachting or distinguished natives like Thomas Arnold, Uffa Fox and Cliff Michelmore. Few have had more claim to fame than John Nash and yet he is not remembered on his favourite Island as much as he might be. Perhaps Cowes will produce another famous architect who will carry on the Nash tradition ... That would indeed be his finest memorial!